Tuataras do it faster than anyone else. Oh yeah, that’s right. You know what I mean. They evolve…at the molecular level. The tuatara of New Zealand is a unique reptile that coexisted with dinosaurs and has changed little morphologically from its Cretaceous relatives. Tuatara have very slow metabolic and growth rates, long generation times and slow rates of reproduction. This suggests that the species is likely to exhibit a very slow rate of molecular evolution. Our analysis of ancient and modern tuatara DNA shows that, surprisingly, tuatara have the highest rate of molecular change recorded in vertebrates. Our work also suggests that rates of neutral molecular and phenotypic evolution are decoupled. Okay, so what does all that mean? It’s been well established that creatures evolve at rates proportional to their generation times. 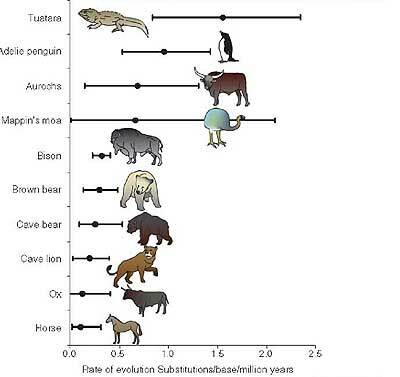 Animals that have a higher generational turn over, show higher rates of evolution. It’s a simple numbers game. The more offspring one has, the more chances for there to be a beneficial mutation. The shorter the time from birth to reproduction, the faster natural selection can act on these mutations. It’s been thought that evolution at the molecular level should mirror what we see on the phenotypic, or morphological level. It makes sense logically. There has to be some connection between molecular evolution and phenotypic evolution. We know that the former gives rise to the latter. So if one has a creature that has a short fossil history, or a particularly diverse one, then it suggests it is a fast evolver. Therefore one would expect to see speedy evolution on the molecular level too. This is one of the latest lines of evidence for automatic endothermy (i.e. warm-bloodedness) in dinosaurs and other fossil critters (don’t ask how we have molecular evidence for extinct animals. I just don’t know). This latest discovery throws a whole wrench into that mode of thinking. 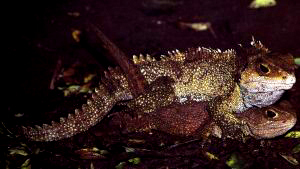 Tuataras (Sphenodon) are one of the slowest animals on the planet. They take a long time to reach sexual maturity (11-13 years). They are commonly referred to as living fossils (though, that really isn’t right). They are the last critter that one would expect to be an evolutionary Speedy Gonzalez. Tuataras are still significantly faster at their molecular evolution. So then, what does this mean regarding molecular evolution rates vs. morphological ones? That’s a good question. The argument of molecular phylogeny vs. morphology, is already a heated one. Morphologists scoff at molecular systematists, while the molecular systematists think morphological phylogeny is pointless since it’s all DNA based anyway. It doesn’t help that molecular data has repeatedly come up with results that fly in the face of morphological based orthodoxy. Morphologically, tuataras are the sister group to squamates. Molecularally, tuataras have been found to nest with crocodiles and birds, in at least one study. Turtles, whose ancestry is still very nebulous, have been found to be anywhere from the base of the diapsid family tree (making them ancestral to all extant reptiles), to offshoots of pareiasaurs, which would place them as offshoots from the main reptile line (basically throwing another 30-50 million years on their divergence from other reptiles). Molecular systematics, on the other hand, has found turtles to nest with archosaurs (crocs and birds). A few times (beware: PDF bomb), despite the lack of morphological correlates. And then there was just weird stuff during the early days of molecular studies, that didn’t help with its validity problem. So both camps are already very skeptical of the other’s findings. Now this study suggests that rates of molecular evolution have no relation to morphological rates. Among other things, this seems to make the whole “molecular clock” idea even less tenuous. It should be interesting to see what repercussions come from this study. Harrison Jurenko on Dinosaur George can bite me! Sockmonkey on So, why go bipedal? Jura on So, why go bipedal?